The most current information on the Sheboygan River and Harbor AOC can be found on the Wisconsin DNR website. 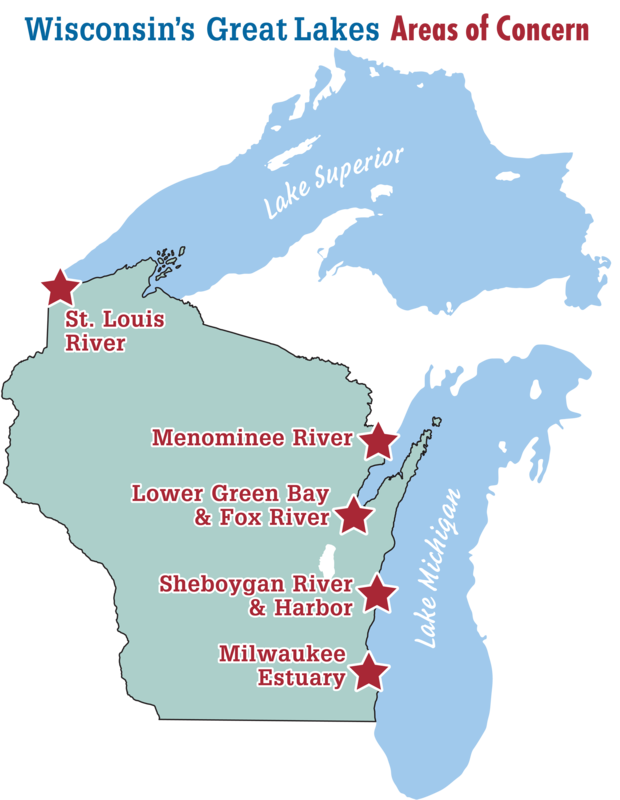 The Sheboygan River and Harbor Area of Concern includes the 14 mile stretch of river from the Sheboygan Falls dam to the Sheboygan Harbor on Lake Michigan. It flows through the City of Sheboygan Falls, the Village of Kohler, and the City of Sheboygan. The river’s character changes dramatically from the upper river to the lower river sections. In the upper reaches, you’ll experience a mostly natural landscape along the immediate river corridor, punctuated by an occasional residential area and the Black Wolf Run Golf Course. There are several very shallow riffles that can make canoeing or kayaking exciting when the water is high enough, or challenging when the water is low. As you float down-river and cross under I-43, you’ll notice a transition to a slower current and more silty river bottom. The river also takes on a more urban character, as you pass under street and railroad bridges, and float along industrial areas, residential areas, city parks, and finally the inner harbor where the riverbanks are shored-up with sheetmetal or rock seawalls. The Sheboygan Harbor was last dredged in 1969. Since then, a restriction was placed on dredging in Sheboygan due to contamination from PCBs. Sediment that settled in the harbor had resulted in an ever more shallow draft for boats. Large vessels could no longer use the harbor, thus limiting activity. In 2012, more than $90M worth of work was done to remove sediments contaminated with PCBs and restore fish and wildlife habitat. We are now in the “healing phase”, watching, listening, and sampling to see how the environment, fish and wildlife respond to the clean-up and restoration actions.